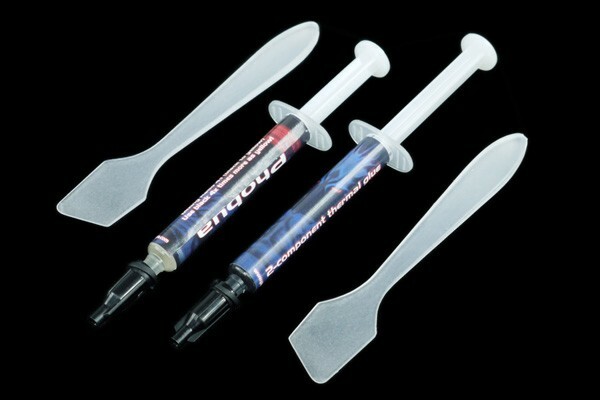 Phobya's 2-component thermal glue: Fixates securely and works like a thermal compound! The possible applications for a thermal glue are diverse, it is mainly used to connect two components and ensure thermal transfer between them. This glue was designed not only to provide strong adhesive power. It will also retain it after sudden load by e.g. shearing force and keep the mostly attached cooler or heatsink in place. To keep the glue fresh and prevent curing, it is shipped in two components which have to be mixed for the glue to become active. The components should be mixed in a ratio of four to one: 4 parts of the black liquid and 1 part of the yellow-transparent liquid. The content of the syringes is exactly in this ratio! A large problem of most glues is that they are basically a thermal insulator. With this thermal glue this problem has been solved: A thermal conductivity of almost 1 W/mK is plenty for most applications. Besides all these technical aspects many practical factors were also considered: For the case of only part of the glue being needed, both syringes are shipped with sealing caps to prevent drying or curing of the glue. To achieve as thin of a layer as possible between heat source and cooler, plastic spatulas are included. Multiple? Of course, this way the first spatula doesn't have to be cleaned elaborately for the next use. Strong adhesive power and high thermal conductivity - that is the 2-component thermal glue from Phobya!